On Wednesday, Tanmanjeet Singh Dhesi secured a Westminster Hall debate on the future of DFID. “There are three compelling arguments both for Britain sticking to its 0.7% level of funding for international development assistance, and for retaining the Department for International Development. First, there is a moral argument. We are one of the richest nations in the world. Surely we have a responsibility to help those in other countries who, through no fault of their own, live in terrible circumstances. Secondly, it is surely in our country’s interests to try to support countries around the world in becoming stable, so their populations do not have to flee either to our country or to neighbouring countries. We should help them become stable so that their economies can grow, and they can have strong public services of the sort we would recognise. Given that conflict is much more likely to break out in a country where there has recently been conflict, if we continue to want to reduce the amount we spend collectively on peacekeeping, it is surely sensible to put in the hard yards by providing development assistance to help those countries get strong, effective Governments who are respected by people of all opinions. “Since DFID was established 22 years ago, it has become a global leader in international development. Every year it spends UK aid in ways that make tangible differences to people’s lives the world over. DFID has helped some of the world’s poorest people realise their right to health and education. It has provided emergency life-saving aid for people caught up in major humanitarian crises and has led the way in bringing gender equality into the mainstream through its development work. The UK public should be proud of the development work that their money has supported over recent decades, but all too sadly they do not hear the success stories of UK aid and the work of DFID. Instead, they hear a loud and vocal anti-aid lobby, which does its best to discredit the work, as many Members today have mentioned. The charge against the country’s aid programme is spearheaded by a small number of major media outlets, who revel in spinning and stirring the few occasions when UK aid programmes might not have worked as we had hoped. They are hell bent on driving a hysterical hatred of the UK’s work to end global poverty. The anti-aid media narrative is a serious problem, but even more worrying are attacks from a number of Tory Members, which have many guises. I will mention three of them. First, there is the straightforward misspending and diverting of aid away from poverty reduction. Last weekend the Guardian reported a letter sent to the Chancellor from 23 international development agencies, raising their concerns about the way Ministers are spending aid. They warned him that aid is being diverted away from the poorest countries in order to promote commercial and political interests. From using aid to help UK companies expand their businesses overseas, to suggestions that aid be spent on UK naval ships, we are seeing more aid than ever being spent on projects that no one sincerely believes are about reducing global poverty. Those attempts do nothing but feed into the idea that the UK aid programme is a waste of UK taxpayers’ money. Secondly, there are blatant attempts to dissolve the Department altogether. It is no secret that the former Foreign Secretary wants to see the Department dismantled. Earlier this month, he threw his weight behind a report that said DFID should be folded back into the Foreign and Commonwealth Office and that the UK’s aid budget should be slashed. Such a move would be a disaster for the country’s aid programme. It is only DFID that has the specific and sole purpose of poverty alleviation and a dedicated staff working to achieve this goal. Merging the Department with the FCO—or any other Department for that matter—would dilute the agenda and see more money diverted away from poverty towards other foreign policy interests. We can learn from Australia, where the international development department was merged with the foreign office, with a number of negative knock-on effects. The country’s strategic vision for aid was lost, the Government witnessed a brain-drain of development expertise and an estimated 2,000 years of collective experience left the department. We already know from our own experience, where almost one third of our aid is spent outside DFID, that only DFID meets the highest spending standards. The Aid Transparency Index, the only independent measure of aid transparency among the world’s major development agencies, rated DFID “very good”, while the FCO’s aid spending was rated “poor”, according to the same measure. Likewise, the ONE Campaign recently launched an aid index that rates aid spending by different Departments. It found the FCO to be “weak” on its ability to keep aid focused on poverty, and that no other Department spends aid as well as DFID. You might have seen it on the news. The regime responds brutally, intimidating protesters and imprisoning, beating, and tear gassing them. And if that wasn’t bad enough, the security services start using live bullets, and deliberately targetting doctors for treating the injured. Doctors, yes doctors, being shot and killed or maimed. Syria, right? But no, this depressing chain of events is, in fact, now being played out in Sudan. It’s almost as if Omar al-Bashir – wanted by the international criminal court for charges of war crimes for the genocide that took place in Darfur 15 years ago – has picked up the phone to Bashar al-Assad to ask for the instruction manual for how to crush protestors – and get away with it. We must learn the lessons of Syria, where Assad has used chemical weapons, killed half a million civilians, tortured thousands, and caused 6 million to flee the country, with almost complete impunity from the international community. Protectiving civilians in conflict is one of LCID’s campaigns. We acknowledge it is a controversial subject, including amongst Labour members. Rightly, we worry about whether intervening in another country’s affairs will do more harm than good. Every situation is different, but we must always be guided by our internationalist principles and by our international obligations such as the Responsibility To Protect Civilians, which we signed up to with each and every government in the U.N. in 2005. This principle acknowledges that when a government either wilfully fails to protect the security of its citizens, or is unable to do so, the international community has a clear obligation to intervene, choosing timely and decisive action from a wide range of approaches, including diplomatic means, sanctions and (only) in the most extreme cases, military operations. 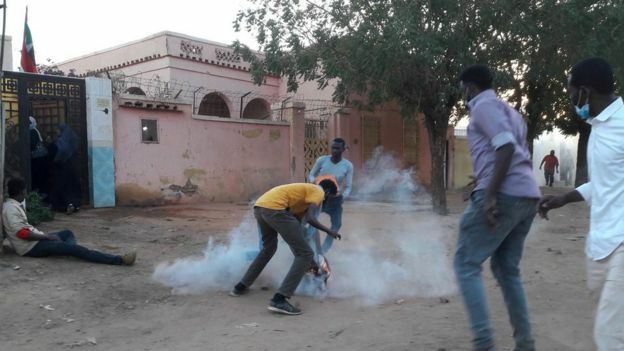 Following that principle, it crucial that the UK Government and the international community responds urgently to what is happening in Sudan and makes clear to President Bashir that human rights abuses against protestors will not be tolerated. The situation in Sudan is still developing and any response must be based on expert analysis of the circumstances on the ground. But we must not just sit back and watch Assad’s playbook be copied and pasted before our eyes by Bashir, with all the shocking loss of life and physical and physcological abuse that would entail. Given what happened in Syria, given a UN Security Council that includes Trump, Putin, and China (with all it’s economic interests in the country and support for Bashir), and given we are distracted by Brexit, I’m not particularly hopeful that anything will be done. It shames us all that the international community is not supporting those who stand up for freedom, peace and justice. I hope I’m proven wrong. “I brought everything from my house, everything I could fit in the car and carry. I even brought my tea mug with me.” These are the words of Maher Mahmoud Al Haresh, a Syrian refugee I met in Jordan last week. Small details like Maher’s mug make us realise how much we have in common with one another. But Maher is one of almost 80,000 refugees living in Za’atari refugee camp, and one of 760,000 living in Jordan, and he and his family live a life that in most ways could not be more different from my own. Despite the admirable generosity of the Jordanians, who have welcomed Syrian refugees to their country, in my visit to the camp last week, I felt again and again the sadness and emptiness that the refugees in Jordan (and other countries in the region) experience. Having fled unimaginable danger at home, they are safe, but cannot imagine the future with optimism, and their day-to-day life remains unbearably hard. Like many of the others in Za’atari, Maher is unable to work, his wife and eldest child are seriously unwell, his children’s education suffers, and there is little hope of the family returning to Syria soon. Aid agencies like Oxfam, UN officials and representatives from DfID on the ground are doing all they can to address this situation, doing their best to create employment opportunities for women and men in the camp. 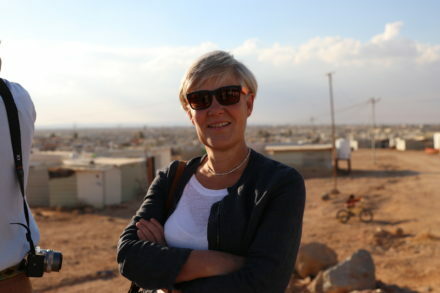 But while Syrian women’s participation in the labour market was relatively high before the conflict, cultural barriers and a very low female employment rate in Jordan, combined with more traditional views of gender roles that war has provoked, plus poor public transport and infrastructure, mean it’s been necessary to create gender-specific projects for women and men to work inside the Za’atari camp. The projects we saw were uplifting. With my fellow parliamentarians Lord Alf Dubs and Tim Loughton MP, I visited a social enterprise where women are making trendy tote bags out of old tents – the very canvas that provided shelter in the early days of the camp’s existence, before tents were replaced with the cabin-like structures the refugees now call home. Oxfam helped the women to set up the workshop, and the bags are now being sold all over Europe, with proceeds being used to support the refugees. Meanwhile, Oxfam has worked with a refugee who previously ran his own successful recycling business in Syria to establish two recycling plants in the camp staffed by male refugees. Women peer educators have conducted community outreach work to encourage families in the camp to sort and recycle their waste. This project also generates income for the camp inhabitants, while improving its environmental impact. Inspiring though they are, these projects are small scale, employing dozens of refugees in a camp of tens of thousands. Some of the younger refugees have never worked. I met a 20-year-old man who had come to the camp at age 14. He can’t go home for fear of being conscripted into the Syrian army. He’s not allowed to leave the camp to find work in Jordan, and there’s no work for him to do in the camp. Meanwhile, his 50-year-old mother, a qualified teacher in Syria, acts as an informal childminder for her neighbours’ children, but she too cannot get formal work in or outside the camp. It’s easy for us to be critical of Jordan for restricting refugees’ right to work. After all, we too in the UK apply unreasonable restrictions that offer only the most limited employment prospects to asylum seekers, despite our high employment rate. In Jordan, the picture is different: unemployment is high, so protective employment policies may appear to make more sense. But the answer to Jordan’s economic challenges lies not in shutting refugees out of the workforce, but in recognising their potential to help to grow its economy, while rebuilding their self-esteem and dignity that come from having a job to do. And the refugees have much to offer. The main avenue that runs through the camp, known as the Champs-Élysées, is lined with food stalls, mobile phone shops, hair salons and bridal gown boutiques – a sign of their entrepreneurial drive and desire to build something out of nothing. Others are highly qualified professionals – like the teacher I met – but whose expertise and knowledge is going to waste. That’s why one of the messages I’m bringing back to the UK government from my visit is that we need to think much more creatively about how we use the power of our aid and influence to encourage economic and employment opportunities for Syrian refugees in Jordan. In particular, we should think about how we can boost employment opportunities for women, as we know that when women thrive their children do well, and for young people, which could avoid the loss of a generation that may otherwise never have the chance to work. These themes are of course very familiar to me from UK domestic policy, where I’ve seen again and again that maximising employment among women and young people benefits not just the individual employees, but their families, communities, the economy and society as a whole. As with Maher’s tea mug, there’s a common thread between the lives of the refugees desperate to work in Za’atari and the lives of those I’ve met who are shut out of the labour market here at home. That’s why I’ll be pressing our government to promote solutions – like access to education, tailor-made back to work employment programmes, real living wages and a right to work for all who want to – for Syrian refugees in Jordan; the very solutions that I’ve long campaigned for in the UK too. Kate Green is MP for Stretford and Urmston. Barely a day goes by where we don’t see horrific pictures showing the devastating impact of war splashed across our front pages. We are facing the largest refugee crisis since World War II and yet Uganda, home to over 1 million refugees, rarely makes the front pages. A daily exodus of mostly women and children are fleeing armed conflict, hunger and sexual violence in South Sudan resulting in what the United Nations has called Africa’s biggest humanitarian crisis. The sad reality is that 61% of these refugees are children, many of whom have arrived at the camps alone. Yet it is here, in the midst of such hardship that I met such brilliant, perseverant children, keen to get an education, make a life for themselves and return to South Sudan. Children like 13-year-old Isaac, who arrived at the camp with just his sister and wants to grow up to be a doctor “We need to be educated so we can return home and build a peaceful future for South Sudan”. Isaac is right, we cannot allow an entire generation of South Sudanese children to become casualties of the civil war, after all it is these children who will pick up the broken pieces of their home and rebuild the South Sudan of tomorrow. British aid is helping them to do just that. On a recent visit to Uganda with Shadow International Development Minister Preet Gill MP and international children’s charity World Vision UK, I felt incredibly proud to see British investment helping to provide these children with shelter, food, education, sanitary pads and vital mental and emotional support. The emotional scars and immense trauma these children have suffered are unimaginably, with many having previously been recruited as child soldiers. We met Abdo, aged 14, who arrived at the camp when he was just 12 years old, both his parents had been killed, making him responsible for taking care of four of his younger siblings. Taking care of four young children is a huge responsibility for anyone, yet alone a 14-year-old boy with not a penny to his name. We don’t know what happened to make Abdo an orphan, too traumatised to speak about his past, but it was clear that he had suffered immense emotional scars. It is UK Aid and fantastic NGOs like World Vision UK who are helping to provide children like Abdo with the emotional, as well as physical, support they need to deal with what they have been through. Providing a safe place where children can recover and rebuild their lives. Britain’s work here should be a source of great national pride. UK aid has provided food for over 1 million refugees, immunised 146,000 under-fives and got over 2,000 children into a classroom, with World Vision alone providing 25,000 children with child protection services and 360,000 people with food assistance. Britain does this because it is morally the right thing to do and demonstrates that we do not neglect our duty to the world’s poorest. The refugee crisis in East Africa cannot be ignored and the conflict in South Sudan will not end tomorrow. We can either wait for things to get worse, provoking an even bigger refugee crisis or we can help people rebuild their lives. Everyone I spoke to in the camp wants to return home to South Sudan when it is safe to do so, they do not want to venture any further from their homes than they have already had to. Yet without the crucial support UK aid, and other international bodies, are providing these refugees will face starvation and be forced to migrate further afield in order to survive. Helping to provide a safe haven in Uganda reduces the push factors which can lead to onward migration to Europe and helps prevent vulnerable individuals falling victim to criminal gangs and people smugglers. At a time when the UK is redefining its role in the world we have a unique opportunity to decide what kind of country we want to be. Theresa May has called for a “truly Global Britain that reaches beyond the border of Europe” and as a Labour member, I agree. Labour is the internationalist party and whether you voted for or against Brexit, we must now use this opportunity to forge an even more positive, global future for ourselves and UK Aid must be a key part of this. Labour is a broad church with a wide range of views, which we openly discuss and debate to the credit of our party. Yet there are few issues that garner such support across the party as international development. Internationalism means a lot to the Labour Party – it is our belief in not being defined and restricted by your start in life and our solidarity with those beyond our shores. Labour doesn’t always get it right and I would be the first to agree with criticisms about how far Labour is prepared to condemn regressive regimes around the world. However, we are united in our stance that Britain cannot neglect its duty to the world’s poorest and most vulnerable. You wouldn’t know it from our newspapers, but Britain is a global leader in development. The work we do is hugely respected across the world, and the Department for International Development (DFID) is regarded as one of the world’s most transparent, effective aid donors in the world. UK aid is a key part of the UK’s global offering, flying the flag for Britain around the world. Something that is more important now than ever before. We may be leaving the European Union but that doesn’t mean we can pull up the drawbridge and turn our backs on the world. Far from it, we must use this moment to go out into the world to build relationships with old friends and new allies alike, forging an even more positive, global future for ourselves and the UK’s partnership with Uganda is a key example of this. That doesn’t mean we can be complacent. Recent events show us how important it is to scrutinise every partner we work with and every program we fund. Wasting aid and funding corruption and exploitation is criminal and we must be thorough in routing this out to ensure our aid is invested carefully, strategically and coherently. As ultimately it is children like Isaac and Abdo who will suffer the consequences of badly invested aid. I would also never try to claim that aid is a silver bullet – it’s not. On its own it cannot solve all the world’s problems, our free trade agenda, active diplomacy and defence strategies are also vital. But as I saw in Bidi Bidi, when invested and implemented well and reaching those in need, it is an incredible force for good in the world and demonstrates that Britain really is Great when it boldly champions its values both at home and abroad. Ask a typical activist what the main causes of global poverty are – and they’ll probably say things like trade, tax dodging, international debt, climate change, 0.7%… But I’m betting not many would mention one of the biggest factors of all – the so-called War on Drugs. So why is it such a big deal for development? Prohibition is the power base of global organised crime. (Think prohibition era America writ large across the world.) It means the street price of their product rockets – resulting in them having enough wealth and power to bring states to their knees. Through combinations of bribery and (terrifying) intimidation, drug cartels render the machinery of states dysfunctional – and to the extent a state does survive it’s often locked in civil war with an illicit empire possessing military might to rival its own. In this context, what hope is there for pro-poor social and economic development? For those forced into poverty to have a chance of having their rights recognised, they need two things – a state with the resources to deliver, and a state that is accountable. The War on Drugs takes away both. Prohibition means the drugs market – one of the world’s largest trading sectors – is completely untaxed. (That’s a form of subsidy!!) A recent report by Health Poverty Action showed that taxing cannabis alone in the UK could raise between £1 billion and £3.5 billion a year for the NHS. And that’s in a diverse developed economy. In many poorer countries the drugs market is a far greater proportion of GDP. Properly taxing it would be beyond transformative in terms of state revenue for essential services like health and education. Prohibition harms public health. The one-size-fits-all law enforcement approach clearly doesn’t stopping people taking drugs. On the contrary, it motivates powerful crime syndicates to increase consumption as much as possible. Worse still, lack of regulation and harm reductions services means consumption is far more dangerous – consumers have no idea of the strength, and no certainty what is contained. Even the simplest food products are required to give us detailed information about composition on the packaging – but for something as dangerous as drugs there’s no regulation or testing whatsoever. The War on Drugs disproportionately criminalises minority ethnic communities worldwide. That’s well known. Lesser known is the fact that it also disproportionately incarcerates women – who are often forced into the more risky and lower paid roles. Forced crop eradication routinely takes away the livelihoods of poor farmers in marginalised rural areas – with devastating effects for them and their families. The War on Drugs prevents access to essential medicines. Excessive bureaucracy (through fear of being perceived as soft on drugs) restricts global supplies of opioid medications – meaning a large proportion of cancer and AIDS sufferers worldwide are denied these painkillers. It fuels violence and secondary crimes – 29,000 lost lives in 2017 in Mexico alone. It disenfranchises people involved in the drugs trade from the state and its services – for example making them afraid to seek help, such as health care and police protection, in case their drug involvement is discovered. Finally, to clinch it… if all the above isn’t enough… the amount spent on the War on Drugs each year is $100 billion. And that’s just the initial spend – it doesn’t include the secondary costs of tackling the problems caused, so the full total is much more. This compares with the global aid budget of $130 billion. Imagine all the War on Drugs money being used to eradicate poverty rather than create it. Putting all this together, a case can be made that the War on Drugs isn’t just one of the biggest causes of global poverty, but possibly even the single most significant factor. So where is our involvement? Why are we so silent on the issue? If it’s because development voices have been afraid of the controversy (and I think, in truth, that’s probably been part of it), then that’s outdated. Drug policy reform today presents far more political opportunity than threat. And even if it didn’t, some things are too important to ignore. We’re at our best in Labour when we stand up and speak out for what’s right. There’s no question that it’s easy to feel frustrated at how slow we’ve been to engage. But actually, the most logical thing to feel here is incredible excitement!! Significant change here is highly achievable. And because there has been so little involvement by the development sector, none of the low hanging fruit have been picked. For a start, Labour should commit to moving drug policy responsibility out of the Home Office. It’s ridiculous that it’s led from there. Instead, Labour should allocate it jointly to the Department of Health and DFID. That simple change alone will make a vast difference. Furthermore, Labour should champion the rights of all countries to explore alternative drug policies, as has happened so effectively for example in Bolivia’s coca control programme. To do this we don’t need to believe that we should reform our drug policies in the UK (although we absolutely should review those too!). We simply need to believe that countries should have the freedom to make their own choices. Labour in opposition should provide moral and political support for those wishing to do this – so that countries in the Global South are able to stand up to pressure from the USA and others seeking to prevent them. And Labour in government should provide them with financial assistance through DFID, along with support for international policy dialogue informed by an increasing global evidence base. Finally, I’d like to offer an observation. Having been a development campaigner for many years, I notice that most of our campaigns have tended to originate in the Global North. It’s not that these haven’t (mostly) been on important issues, and global justice movements throughout the world have often been pleased to be part of them. But the War on Drugs is one of the very few issues that I’ve been actively, and passionately, lobbied by leaders of the Global South to campaign on. When we’re selecting our priorities, that last point should make a difference. If we choose to listen to them and take action, the cause of development can be transformed. We’re always looking to get our members more involved with out work. We recently surveyed our members about what events they would like us to host, and how they would like to be involved.